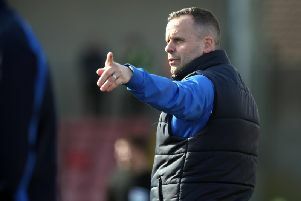 Philip Lowry climbed off the substitutes' bench on Saturday with an injury-time goal as Crusaders bounced back from 1-0 down to defeat Warrenpoint Town in the Danske Bank Premiership. Warrenpoint took the lead before Jordan Owens equalised in injury-time at the end of the first half - then Lowry made his mark off a corner-kick by another substitute, Ross Clarke. Celebration time for Philip Lowry (right). It handed the defending league champions a vital away victory.